Martha Berry responds to S. Mims Harrison's letter, offering her mother's house near the Berry property. Martha Berry states that, at the current time, they are not interested in aquiring the house, but might be interested at a later time. 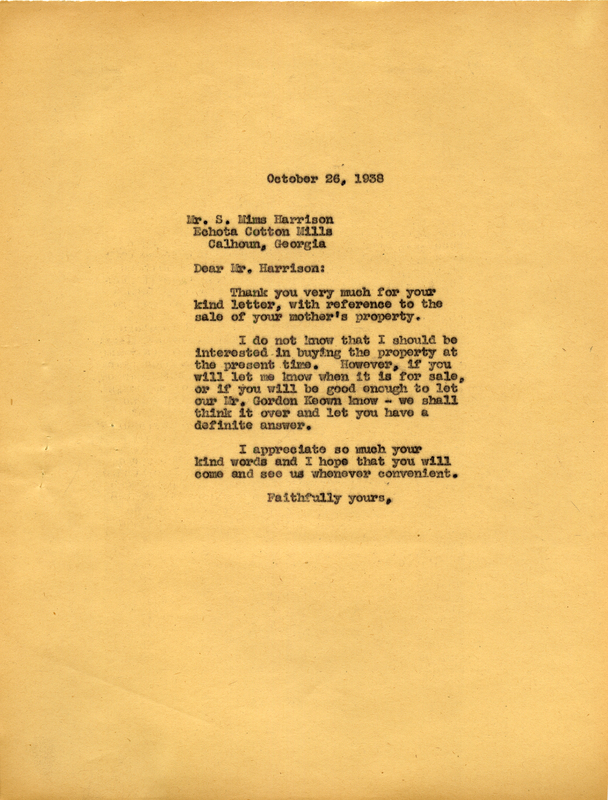 Martha Berry, “Letter to S. Mims Harrison from Martha Berry.” Martha Berry Digital Archive. Eds. Schlitz, Stephanie A., Olivia Mund, Justin Karch, Jessica Hornbuckle, et al. Mount Berry: Berry College, 2016. accessed April 24, 2019, https://mbda.berry.edu/items/show/14403.